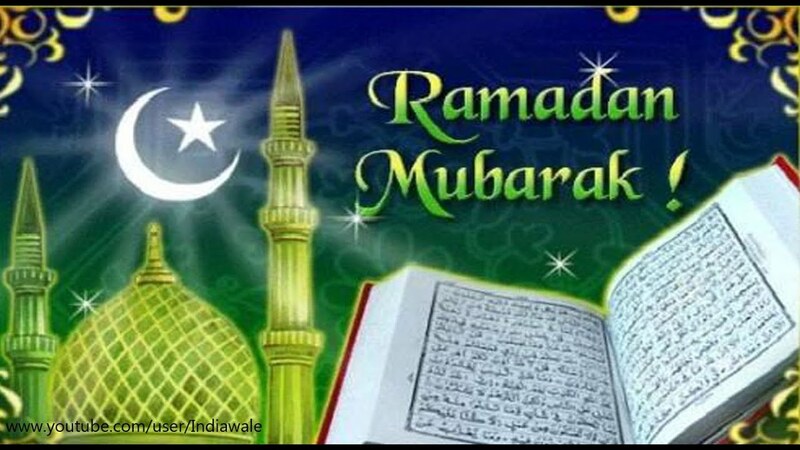 Posted on June 25, 2017 by Veena S.
At the end of a month-long period of fasting(Sawm), Muslims all over the world celebrate Ramzan (or Ramadhan). In Arabic, the word Ramzan means dryness or scorching heat…referring to the stomach dryness during fasting. Decorative lamps, table ware, flower bouquets, gifts articles, glittery slippers, sandals and purses, lace and zari trimmed dresses as well as special food treats are packed into every inch of space in shopping malls, markets and restaurants to usher in the festivity. Mounds of thin, crispy noodles or seviyaan sit in circles in sweet shops, Dates filled with pistachio or almonds grace dry fruit stores in the Gulf region and Haleem, a local Hyderabadi dish prepared with pounded wheat, meat and lentils is extremely popular. Here are some photos sent by friends as they get busy in the malls or their homes preparing for the celebration. Fasting ends after the evening Asar prayers, and the first food to be partaken is the succulent, nutrient Dates. Here is last year’s post on Dates. 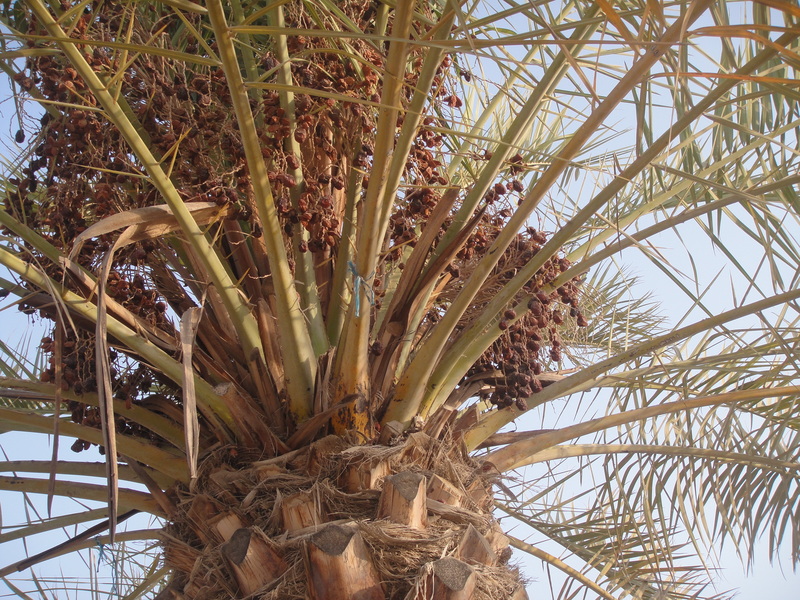 At this time of the year, Date Palm fronds are filled with reddish raw fruit, that soon turns golden-yellow in the summer heat. In Hyderabad, as people throng to city mosques for evening prayers,street carts filled with Date fruit and sliced mangoes, papaya and watermelon are sold. After the fast…then feast, then shop or visit friends and relatives to exchange gifts. My Lebanese friend, an excellent cook sends me some virtual treats 🙂 Kunafeh is a rich luxurious dairy dessert popular in Egypt, Lebanon, Syria, Palestine and the neighbouring countries. Filled with ricotta cheese and decorated with crusty shredded khadaif noodles, Kunafeh is laced with plenty of sugar syrup and rose water….yumm..melting in the mouth! Another friend from the Gulf region sends photos of her family reunion feast. They have been busy preparing sev ke ladoos (vermicelli coated mawa or cheese balls), almond filled Dates and a plate of Kharak laced with mawa, pistachios and almonds and popular Sheer Khurma. Nutritious, healthy and filling desserts! Thanks Nisrin…I wish I could come home to wish you all and enjoy the feast. Enjoy the food feasts, shopping and visits to family and friends this festive season. It’s a shame I’m not courageous to visit the famous Begum Baazar market in Hyderabad, where Ramzan charity markets are set up. The surging crowds are a bit daunting now. Posted on January 31, 2015 by Veena S.
Italy is a gastronome’s delight! Regional diversity in food, traditional recipes passed from one generation to another and the sauces and herbs that lend flavour to few basic ingredients are the essentials of Italian cuisine. Move over Italian pizza, pasta and cheese. The secret’s lie in the countryside, local village inns and AgriTurrisimo places that serve authentic local food. After picking fruits in Valtellina, in northern Italy, Sondiro valley (Fruit trail) people suggested we must try Pizzocheri. Have you ever heard of it? Well, we sat down to dinner in a charming old Lombardian châteaux characterized by low ceiling and brick walls. Pizzocheri is a flat ribbon-pasta made fresh with buck-wheat flour, cubed potatoes, local Cazera cheese and liberal addition of green herbs. Yum… al dente pasta in a rich creamy sauce, was very filling! Nearby Lateria, cheese mart stocked chunks of Cazera and other assorted regional cheese. There are about 400 different types of cheese with Mozzarella, Parmesan, Cazera being most popular. Staple dishes in the north include semolina, durum flour, buckwheat flour and rice. Whereas, southern Italy is home to pasta in tomato sauce and variety of couscous and vegetable soups, influenced by Greek and Roman neighbours. Swiss and German desserts are popular in the north, but food is more robust and peppered with Arabic and Mediterranean influence in southern Italy. They use plenty of figs, olives, tomatoes, grapes and lemon. Here is a recipe for a simple, hearty antipasto (appetizer) often served with a glass of wine. Bruschetta, or brusketta is a grilled bread topped with plump summer tomatoes and rubbed with olive oil. The origins may lie in the fact that Roman olive growers roasted bread to sample along with freshly pressed olive oil, bread being staple diet. I’ve made fresh home-made Ricotta cheese (Indian Paneer) for a protein filled antipasto. Pre heat oven to 250 degrees for 10 mins. Place the slices on oven tray. Lightly brush them with olive oil and toast them for 5-10 mins. till lightly browned edges. Remove from oven. Rub a raw garlic clove on the toasts. Place toasted bread on a plate. Drizzle more olive oil. Garnish with chopped tomato, olives, herbs, salt and generous topping of Ricotta cheese. Decorate with thyme or parsley. Store extra cheese in airtight container in fridge for 4-5 days. Serve warm. A perfect, healthy afternoon snack. But, eat like the Italians! Bruschetta served with a glass of red Italian wine. Do leave your tips and comments if you make this recipe. What toppings did you choose? Posted on August 3, 2014 by Veena S.
There is nothing more Australian or Kiwi than the Anzac biscuits (and the Pavlova!). Bite into these delicious, crunchy, chewy oatmeal biscuits with a hint of coconut and you will understand why the women of Australia /New Zealand made them historic. Yes, and they are still baked for charity every year. Anzac biscuits are associated with the Australian and New Zealand Army Corps (ANZAC) established in World War I. ANZAC Day is celebrated on 25th April in both countries. Biscuits were baked and sent by wives of these soldiers, the ingredients chosen so that they would not spoil easily. The biscuits would keep flavour and freshness while being shipped overseas. During the World War 1, the aim of the Army (ANZAC corps)was to land at Gallipoli and capture Constantinople (now Istanbul). To date, a ceremony takes place at 10:15 am on 25th April, at the War Memorial in Australia and New Zealand. After the ceremony, families place red poppies besides the Memorial’s Roll. Women still bake Anzac biscuits for charity and distribution on this special day. Here is my friend Debbie and family, from New Zealand sharing their photos. The medal and red poppies are traditionally worn in remembrance. Thanks Debbie! Famous Anzac biscuits (lovingly called bikkies), can be made using a recipe from Edmond’s Cookery book. Here is my revised recipe from Australian Woman’s weekly. I reduced the amount of desiccated coconut. I did not have golden syrup so I had to add few extra drops of water, else the oatmeal crumble was a bit dry. Sift the dry ingredients together, lightly airing them while sifting. Add baking soda to boiling water in a cup, set aside. In a saucepan, melt the butter lightly, (add syrup or honey), gently add the water /soda mixture and see the bubbles rising. Turn off flame, keep stirring and the bubbles will soon settle. This mix will soften the dry oatmeal crumble..so be patient. Heat oven to 190 degrees for 10 minutes. Pour into the oatmeal crumble and blend gently in cake mixer or use wooden spoon if working by hand. Tip!- As I had not used syrup – I found the mixture very dry, so I added few drops of boiling water. Line butter paper on oven try or prepare with light grease and dust with flour. Take an ice cream scoop or wooden spoon, scoop out a ball of dough mixture and pat on a tray, leaving wide space between. Bake about 8 -10 small biscuits at one go ( or 5-6 large ones). Bake for 10- 12 minutes, till edges turn golden brown. Centre remains bit soft. Cool on wire rack. A healthy snack is ready. Is there a specially dedicated food towards war heroes you know ? Any baking tips on these biscuits you would like to share ? For another New Zealand recipe click here. Posted on July 26, 2014 by Veena S.
Date Treats from Middle Eastern Cuisine. The entire Middle East region abounds in Date cultivation, the fruit being regarded holy and healthy. 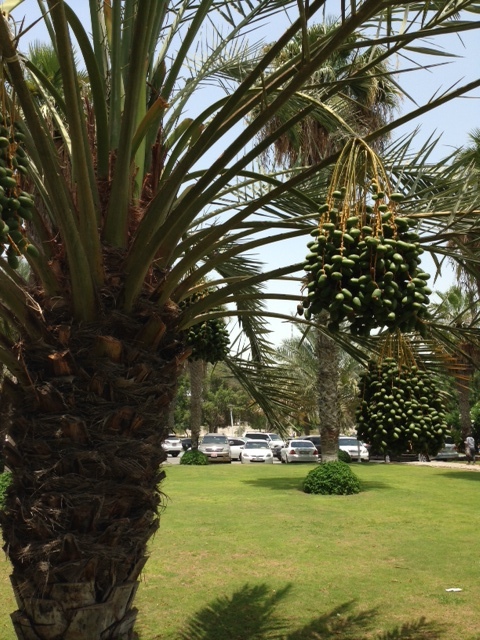 In UAE (and other Middle East countries) the green Date palm trees abound in the harsh, arid landscape. Often people are seen taking rest under the shade of these trees, relaxing away from the mid day sun. During the fruit season in summer, there is plenty of fallen fruit to enjoy. No wonder Middle Eastern cuisine makes use of Dates to prepare a variety of dishes: Date halve, Arabic date and cardamom cake, Moroccan chicken and Date Tagine, Egyptian milky date pudding, Lebanese Date cookies (Mamoul), Date desserts with pistachios and almonds …and the list is endless. It’s the Ramadan – the holy month. The Muslim community celebrates a month-long fasting period from dawn to dusk. Dates form an integral and important part of the fast – it’s the Holy fruit. After the evening prayers, at the Iftar meal the fast is traditionally broken by eating the Date fruit. It gives the body immediate sugar and protein, as well as prepare the empty stomach for richer food intake. Dates reduce cholesterol, abdominal pain, inflammation and have many other medicinal qualities. No wonder it’s a well-loved fruit. Dates are eaten raw or ripe. Raw fresh dates (Rutab) are golden coloured and have a crunchy, fibrous nature. Local Emirati, Omani and Lebanese eagerly await the summer fruit every year. The ripened fruit is dark brown, sweet and succulent. Here is an easy milkshake recipe. Often children are given this as they return from school – makes a healthy, nutritious and cool drink. Almond /Date Milk shake: This is a simple, healthy, traditional summer treat given to children as they return from school. Dates provide healthy sugar. Method: Soak the dates and almonds in warm water for 10 minutes. Remove skin from almonds and loosen skin from dates. In blender, make paste of almonds and dates, adding milk as desired. Note the colour change from dark brown to light brown. Put some crushed ice into 3 glasses. Pour frothy blended milk /date mixture over them. Decorate with sliced almond. Serve immediately. Guest contribution: Nisrin is my childhood friend, currently living in Dubai. She is celebrating Ramadan and has been fasting (and feasting too). Thanks Nisrin, for sharing your recipes and tips here. 3. Substitute yoghurt and milk interchangeably if desired. • 1 ½ cup milk, • 1 tb spoon oat bran, • 1 Banana, • 4 dates soaked in the milk overnight ( Mejdool are best!) • Vanilla to taste – optional. Blend it all together in processor, pour into each glass. 2. Banana – Date Smoothie ( makes 2-3 glasses) • 250 ml plain yoghurt • 120 ml milk, • 120 ml dates, fresh, pitted and chopped and soaked overnight in the milk • 2 bananas, sliced • 8 ice cubes – optional Blend all ingredients ( except ice). Put ice cubes in each glass, pour smoothie on top, and let froth top. 3. Spiced Banana Date Smoothie (this is her favourite)! Blend all ingredients, except ice. Serve ice cubes in glasses, pour frothy smoothie into glasses, decorate with nutmeg /cinnamon powder. Due to the festive Ramadan season Lebanese sweet shops and market shelves in UAE, are filled with assorted sweets and decorated dates – coated with chocolate, stuffed with pistachio or almond powder, layered with fresh cream, date balls rolled in coconut. Ah..my sweet tooth is craving. Here is my contribution. A healthy, traditional dessert served at Iftar party during Ramadan. Take 4-8 Mejdool /Deglet Noor / any large fleshy dates, keep at room temperature. De-seed them gently. Stuff them with blanched almonds (or coarse pistachio powder). Arrange on plate. Dress them with whisked fresh cream. (here is the health tip : I used thick yoghurt, lightly whisked + 1 spoon sugar). Pour gently over the prepared Dates. Garnish with lemon and orange zest. Adding chopped pistachio or toasted pine nuts, gives more colour and texture. Serve at room temperature. Isn’t that enough for this time? I’ve been busy reading about many Date cookie recipes. As soon as I’ve made a batch, I will share it with you all. If you would like to share any Date recipes – do email them to me. It makes the world a richer place. Posted on July 15, 2014 by Veena S.
Have you ever visited a food market? Well, such weekly markets,cater to selling fresh food, in a relaxed setting under the sun. Isnt’ that exciting – no home preparations, no kitchen cleaning. Instead, just wander around, peek at the delectable food and enjoy a market ambience! That’s how I spent one Friday morning in Sydney. A short stroll from Circular Quay, towards the historic buildings on George Street is The Rocks. It so popular on the weekends – you cant’ miss it. Every Friday, from 10am – 3 pm, the Friday Foodies Market, changes the scene from a quiet office and boutique cafe section to a noisy, carefree weekend market. Welcome to a row of white tents, bustling crowds and exotic food! The country cycle is such a typical European market icon. Look, how it invites the city people here. In recent years, Sydney has become home to immigrants from diverse countries. Home to Aboriginal and European settlers, the popular city is now home to other cultures too – Chinese, Japanese, French, Canadians, Indians, Filipino and Turkish, to name a few. Weekend food markets in the city ? A great place to be spoilt for choice! French cheese and caviar, Turkish Gozleme, Moroccan coffee and dates, Japanese steak and stir fry, Australian wine and dairy products like cheese and cookies. Hmm…what would you like to try now? There is something casual and romantic about street markets. Nestled right in the tourist and down town office area, this market has become so popular and growing in the past 10 years. Where else can you get a hand made chocolate or fresh made French crepe on the street? Can you hear the laughter and weekend chatter? Just stand in the queue, the longest one – and feel the relaxed spirit. Today, there are smartly dressed office men in suits, children tugging the mother’s skirt, tourists adjusting their backpacks and the aimless wanderers taken in by surprise. ‘Is that the queue for Turkish Gozleme?’ I ask the young ladies standing in a long winding queue. ‘Yes, but it moves very fast, about 20 minutes waiting. We come here every Friday – and just love the hot pancakes!’ they said. Well, that will be my lunch too. Look at the mounds of soft white dough, quickly patted and rolled by Turkish women. Then its stuffed with Feta cheese and spinach (beef is optional). A quick drizzle of oil on the hot pan to cook the pancake. ‘Salam Ale Quum’ – greets the young Turkish immigrant as he cuts and puts the crisp, hot flatbread – perfect Turkish Gozleme carefully into styrofoam containers. In a jiffy! Brisk sales here. Now, isn’t your mouth-watering too? You can take photos of a food market and invite me, next time. At the end of the market street, were stalls selling art/ bead work, clothing, hand-made jewellery, candles and even chocolates. A fun time for all. That’s it..I went straight to the harbour to watch the Sydney boats go past the Opera house and enjoy some fresh food. Wait…. do I need some coffee too? A cup of coffee, anyone ? Have you ever visited a fresh food market? What did you eat? Where? Posted on July 10, 2014 by Veena S.
Dates – The Holy Fruit of Middle East. It’s the summer season in the Middle East, as well as the holy month of Ramadan. Supermarket shelves are brimming with gift packs of Dates. The fleshy, sweet fruit in many shades of brown makes for a colourful and intriguing sight. Have you ever wondered why the Date fruit is so important to the Islamic culture? Muslim friends and neighbours tell me ‘Our Prophet Mohammed recommended to break the day long fast, after Iftar prayers, by touching the Date fruit to the lips,then slowly eating it.’ Dates give the hungry body a surge of carbohydrate sugar and protein. It prepares the body for further intake of food. They protect the fasting person from having constipation as a result of changing meal times. I’ve recently visited supermarkets like Lulu, Carrefour and the Al Mina Date market in Abu Dhabi. With more than 30 varieties to choose from, this is such a confusing task, especially for a novice like me. How do I choose – raw or ripe? Dark or light colour? Which products are superior and why? Where do they come from? Hilali and Mejdool dark variety. Dates are grown all over the Middle East and as far as Iran, Iraq and Turkey. The Mejdool and Hilali from Saudi Arabia are prized for its large size and succulent flesh. In the UAE – Al Khanizi, Al Khallass, Al Nukhba and Fardh are popular, grown around the Al Ain and Liwa region. Each variety stands apart in size, colour, flesh, sugar content and moisture. Look at the elaborate wrappings of Date boxes! Some packed tightly with pistachio and almond fillings, others have sesame seed decorations on it. Some modelled like the tree or heart shape. Loose Dates are sold by the kilo or in smaller quantities. The Al Mina Date market has more than 15 shops fitted with outdoor stalls. Large aluminium trays laden with wide varieties of Dates, rest on counters, as though patiently awaiting a customer. The plastic sheath covers them from insects and flies, that are often attracted to the sweet fruit. One is welcome to taste a few before buying them. Rutab are raw yellow /red Dates. They are fibrous and slightly tannic in taste. Local Emirati enjoy eating them as a healthy snack. The goodness of dates cannot be overlooked – they have immense health nutrients. They can stimulate muscles, relieve menstrual pain and depression, improve vision, good for cholesterol. The alkaline salts adjust the acidity of blood, thereby reducing diabetes, gout and renal stones. No wonder date recipes exist in almost every Middle Eastern /Arabic/Lebanese cuisine! Look at my recipe section for easy date recipes. Abu Dhabi (and the Gulf region, Iran, Iraq and Turkey) is luxuriously dotted with the date palm. The sturdy tree has a coarse, hairy trunk growing vertically. It supports large rough,leathery fronds. Once a year the tree bears fruit, blossoming during summer. The more intense the heat, the sweeter the fruit! As the heat intensifies, the fruit changes colour: green to yellow, then orange/red and finally a dark brown. A story in the Quran says that when the mother of Prophet Jesus (peace be upon him) was giving birth to him, she was experiencing pain. Allah consoled her and told her to shake the trunk of the palm, promising that fresh, ripe dates that drop down would heal and give abundant energy. Till date, all over the Middle East countries, people can rest under the shade of the tree and eat the abundant fruit that falls to ground upon ripening. True acts of charity and welfare in the harsh summer conditions. So head off to the nearest Souk or traditional market, if you are around the Middle East region. Pick up few boxes of choose this delicious fruit and share with your friends and family. Crunchy, fresh dates – best eaten raw. To all my Muslim friends, bloggers and viewers – Ramadan Kareem. Enjoy eating, stay healthy. Eat Dates. What is the fruit of your country? When is the best season to buy it? How do you eat it? All content copyright Veena S. (2013 -2016) http://www.walktomarket.wordpress.com. Please see copyright disclaimer. Posted on June 25, 2014 by Veena S.
The first time I had a French crepe was on a trip to Paris, many years ago. We visited Montmartre a historic and quaint area on the hill, outskirts of Paris. Officially dubbed as artist’s enclave it boasts of many art galleries and fine restaurants. We awaited our dessert. Filled with orange butter sauce and drizzled with chocolate flakes it looked stunning and divine! Orange and chocolate made for contrast flavours. Crepe is the French version of a light and versatile pancake, it is made as both sweet and savoury snack. It reminded me of ghavan, an Indian pancake, that my mother often made as a quick after-school snack. Fill the crepe with fresh strawberries and cream or just spread Nutella or chocolate sauce – Voila! a dessert crepe is ready. Else. like the French stuff in some sautéed asparagus, garlic pod and pine nuts – a savoury snack in a jiffy! Here are some interesting names of pancakes around the world: Mexican tortillas, Russian blini, German pfannkuchen, Korean jeon, Malaysia apam balik, Indian cheele or dosa, ghavan, adai, British pancake and …….maybe you can tell me some more. Crepes can be made with 4 basic ingredients, easily found in any kitchen: flour, milk, butter, eggs. Not being a very crepe fan, I tried making a recipe from http://www.bbc.food.com. I tweaked it a bit by adding 1 table spoon of semolina to the batter to give a nutritious and crunchy texture. I used only 1 egg, instead of 2. Make some caramel sauce to drizzle over, if you wish. Sift together flour, sugar, semolina and salt; set aside in one bowl. In another large bowl, beat egg and milk together with an electric mixer. Beat in flour mixture until smooth. stir in melted butter. Heat a lightly oiled griddle or frying pan over medium high heat. Pour or scoop 1 ladle of the batter onto the griddle. Tip and rotate pan to spread batter as thinly as possible. When one side is brown, toss over to other side and cook. Remove and keep aside. Make all crepes and stock on each other. Fill each crepe with sliced banana ( strawberry, orange butter sauce). Fold over into quarter. Dust with cinnamon powder and icing sugar. Scatter some pine nuts or toasted almonds. Put a dollop of fresh cream and decorate with strawberry. Serve hot or cold. A tropical twist to the traditional French strawberry and cream: Add a dollop of mango ice cream and decorate with fresh mango pieces. Be creative, be kitchen friendly. Crepe fillings are so versatile. Posted on June 13, 2014 by Veena S.
Once on a trip to France, I noticed how indispensable the shopping basket was for the French. Whether on the streets of Paris, with a baguette tucked into the oval basket, or brimming with fresh vegetables and fruits in a tote, those classic French-style baskets were definitely part of daily life. A French love affair with the basket, bread and cheese, isn’t it ? In the quaint town of Blois, on a summer morning, I stumbled upon the country market. Following women carrying totes I admired the strong, durable leather straps . Made of palm leaves or straw, the baskets are very durable and eco-friendly. I walked the narrow, cobbled streets leading down from the majestic chateaux towards the mighty river Loire. And behold! there was the weekly market, buzzing with activity. The colour of fresh fruits and the lively chatter of French customers made this weekly market a great place to experience. Every Wednesday and Saturday, from 7am to noon, the street became epi-centre of the town. Men and women, tourists and locals, young and old, made a bee line to catch the freshest and best produce. Wait! I almost began counting the number of shopping baskets, and admiring the shapes too! ‘Oooh, la la Madame, ne touche pas’ retorted the street vendor, re-arranging the wicker – woven baskets at his stall, near the street entrance. I was in no mood to buy one. Behind me, through the narrow street corners, rose the majestic chateaux de Blois. 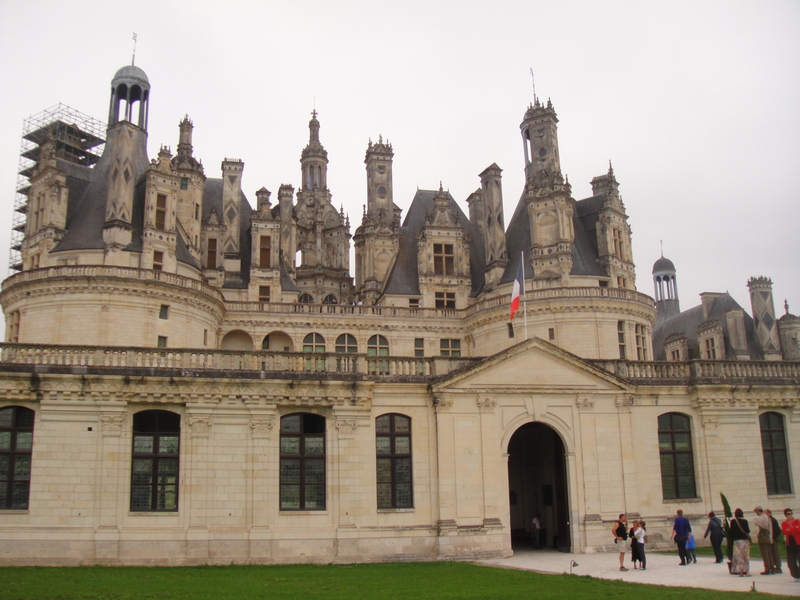 Adjacent stone buildings with tall turrets, were remnants of the grandiose life style of the aristocrats who often spent summer in Blois. Makeshift tables laid out displays of meat, fish, eggs. Colourful vegetables and seasonal fruits were as if, painted in the brightest colours. They caught the morning rays that shone brilliantly on them. Protecting the produce from the sun, large brown and blue awnings hung fluttering overhead. Some vendors quickly gulped down strong, black coffee or nibbled on fresh bread to energize themselves ahead of the busy shopping time. ‘Bonjour, savant?’ greeted men and women as they met friends. Shopping is a social affair at a French market. Small town people know each other better than in big cities. Clutching baskets in hand, greeting with a quick traditional French kiss on the cheek, they settled into conversation. Time stopped. Finding a bread stall is not difficult, choosing the right bread is! The market had more than a dozen vendors selling bread or pain, as it’s called in French. A lady vendor explained the 4 basic ingredients for baking: flour, yeast, water and salt. Thanks to the creative French bakers – we now have as many varieties of French bread as their regions! Take the baguette – it’s a long stick-like crusty bread. When horizontally cut into a slice, it eaten with cheese or soup. Often one finds hungry people heading home from work, tearing a piece to nibble along the way. Or just make a quick sandwich, like this vendor. Stuff fresh greens, cheese, ham or tuna into a pre-cut baguette and voila! A meal on the go. Did you know that, shortage of bread in the Revolution of 1700’s caused street riots? The rich and wealthy ate wheat and white bread, the poor ate flatter loaves with less cereals. Today multi-grain is replacing white flour, towards a healthy choice. There’s special bread for dessert. Don’t just put jam or honey on the baguette! Choose from Pain au chocolat, almond croissant, sweet buns filled with cream and raspberry, orange loaf, banana bread, brioche, pain au noix studded with walnuts or head to the nearest boulangerie. Like the French, I too was particular. I stood for 15 minutes to get this loaf sliced. Move on to cheese stalls. A 1000 varieties ?Only in France is this possible. There is one cheese for every year. (un fromage par jour de l’année). Did the number of cheese stalls exceed that of bread, I wondered. French prefer local cheese to industrial mass production. People discuss ‘what and where’ the cows have eaten. Often when buying cheese, the vendor would offer a small slice to taste, as if it’s bait. Unable to stand the strong smell of Blue Gruyère cheese offered, I hesitated. ‘Try it’ said the lady, ‘c’est frais’. I bit through the texture. Amazing softness! The cheese was so salty. Yet, I bought 4 varieties of fresh cheese, that would make a perfect French style dessert for my lazy picnic by the river Loire. Cutting cheese is an art. With a special knife, gloves worn on hand, the lady placed the cheese on a wooden board. Meticulously she cut a wedge – from middle to the rind ensuring every customer gets soft and firm bits. Aged Goat cheese. Spot the toy goat! Popular French cheese is: Emmenthal, Camembert de Normandie, Roquefort, Le Vieux Lille, Le Munster, Le Cantal, Brie, Le Mariolle and regional products. Now, wasn’t that a lovely way to understand French culture? A great way to spend a summer morning as a tourist too. No, shopping basket for me – my cloth bag would suffice. Pushing in fresh lettuce, crunchy cucumbers and sweet seasonal strawberry, I took one last view of the sounds and colours of this weekly market. For who knows? If you don’t visit Blois on Saturday…the market would be in another town. Avoir Blois, avoir Paris, avoir France. Tell me about a town market you have visited. Or the food of that region. Posted on May 25, 2014 by Veena S.
Turkey is a food lover’s paradise! Turkish cuisine is one of the three great cuisines of the world – other two being Chinese and French. The Ottoman Sultan’s chefs, were specially brought to the Istanbul palace from the mountain regions of Bolu. At the Topkapi palace, they devoted themselves to creating an elaborate unrivalled menu! The Ottoman traditions like weaving, agriculture and family business changed the social culture of Turkey. Turkey’s rich and diverse geography produces seasonal fruits, vegetables, olives, wheat, barley, fish, goat’s milk – a treat for the chef. Geography defines cuisine – fish from the coast of Marmara and Aegean sea, Anatolia is the bread basket, the Balkan mountain goat and sheep give milk and cheese products, fruits in cooler northern regions. A traditional Turkish menu, at home, bus terminal or a luxurious restaurant will include : meatball Kofte, Shawarma, Kebap, roasted aubergine, lentil soup, chicken /mutton biryani, Shakshouka, Mehmet broad beans, banana milkshake, fried Haloumi cheese with olives, Turkish eggs or Menemen. Trays filled with colourful pastries and puddings are dessert menu. Now, enjoy it just like the Turks do – families gather together at tables, pass plates and smoke traditional hookah. ‘Laugh and be merry, it helps digest the food’ goes the saying. Turkey’s famous sweets are: Baklave, slurpy Turkish ice-cream, Pistachio Halve, Tahini Halve, Lokum sugar cake or grain based puddings, sitting pretty in colourful containers on bakery shelves. No meal is complete without a traditional pot of Turkish kahve, or coffee and almond filled dates. ShubhanAllah! God is kind and merciful. Careful! the slippery ice cream may run just miss your fingers. Scrambled eggs or Menemen (pronounced Meh-ne -men), is a classic Turkish breakfast, influenced by European and Asian cuisines. It is heavily drizzled in olive oil and flavoured with spices. Dollops of fresh goat’s milk yoghurt, black olives and Feta cheese, ham slices are nutritious accompaniment. Seasonal fruit like oranges, apples, plum (Elma )and apricots (Kayisi) and fleshy figs (Incir) are perfect sweet note to end upon. Warm up the olive oil in a heavy bottom frying pan. ( Do not over heat oil !) Add the onion and stir till soft brown, add chopped green or red peppers and cook further. Add diced , seasonal tomatoes and simmer for about 5-7 min, or until most of the moisture evaporates. Sprinkle some chilli flakes and ground pepper. In a bowl, lightly whisk eggs and slowly fold into pan mixture, gently stirring. You don’t want to over cook your Menemen – it will go crumbly, it’s better to have it a bit on runny side. Drizzle plenty of olive oil – it’s good for your skin and health. Once the eggs are scrambled, crumble white Feta cheese on top. Take off the heat. Garnish with chopped parsley or fresh mint and few pieces of peppers to decorate further. Menemen must look bright and colourful! Wash the okra and wipe with a kitchen towel to remove the water. Discard both ends of the okra Wash the okra and wipe with a kitchen towel to remove the water. Discard both ends of the okra but keep the okra whole. Make a slit in the centre and keep aside. Heat the oil in a pan and fry the onion pieces till translucent. Mix in the tomatoes and stir fry for another 2 minutes. Add the okra and cook on medium heat for 5-7 minutes. Lower the heat and mix the remaining ingredients. Cover with a lid and cook till the okra are tender. Remove and serve hot with bread, Feta Cheese and bowl of yoghurt. All content and images copyright Veena S. (2013 – 2015) http://www.walktomarket.wordpress.com. Please see copyright disclaimer. Posted on May 21, 2014 by Veena S.
Carrot Cake – An additional recipe from New Zealand. Recently on my visit there, a dear friend Jennifer quickly busied herself in the kitchen. I followed her to inspect her quick movements – beating eggs, followed by grating carrots with hand-held grater then sifting the flour and spices. Finally, before serving us dinner, she popped the mix into the oven. Voila! warm aroma of a delicious carrot cake for dessert. Is this a traditional English or American cake ? When and why did it become popular? What are the basic ingredients ? Or is it a Venetian invention of a popular Jewish recipe, as claimed ? 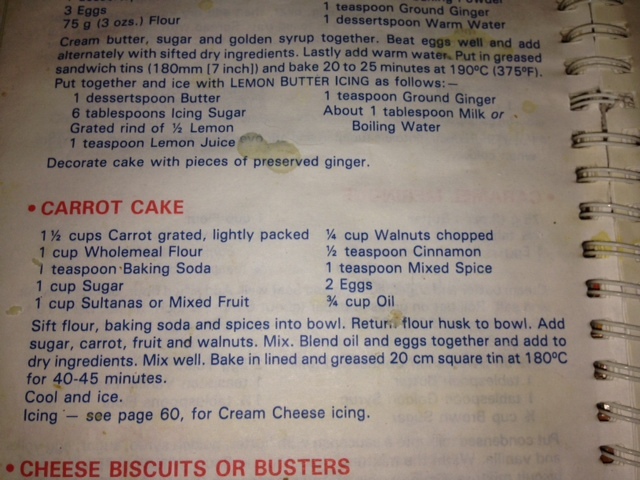 A Polish friend of mine remembers her grandma often made a steamed carrot pudding /cake. So it’s a timeless classic. In the mid 1990’s with sugar rationing it became expensive. Soon local grown carrots became is good, healthy substitute. Also imported dried fruits were pricier. Carrots probably found their way into puddings, juices and exotic meals. Cake basics are : flour, grated carrot, spice and dried fruit, moistener like yoghurt or oil and healthy eggs. Carrot cake is perfect for a coffee morning or if topped with zesty orange icing – makes for a wonderful birthday cake, suggested my friend. The Edmonds Cookery Book has been part of every New Zealand home for the past four generations. The first edition published in 1908 by Thomas Edmonds after Edmonds Baking Powder became hugely popular. A 50 page booklet of economical, everyday recipes, this book is often given as wedding present to the new bride. My friend is a big fan of these simple recipes too.. Thanks for sharing your recipe book with us. And thanks for treating me to a delicious, moist carrot cake served alongside home-grown grapes. Enjoy and feel free to post your comments and share your recipes.